The tropical water below our 48-foot luxury catamaran is swarming with sharks. Michel Dieudonné holds a beat-up cooler filled with rotting bonito carcasses over the stern. At the count of three, he pours a few gallons of putrefied blood over the transom, turning the Windex-blue water a cloudy brown. His business partner, Yves Eeckhout, ties one end of a deck rope around a bonito head and dangles the carcass a few inches from the water’s edge. An eight-foot-long lemon shark breaches to grab it. Rather than let go, Eeckhout yanks, and the two of them play tug-of-war until the shark severs the fish from the rope and swallows it in one gulp. “Now they are hungry,” Dieudonné says. He and Eeckhout have gathered a crew of shark conservationists at Tiger Beach off Grand Bahama Island, in a stretch of water known as Shark Alley, to test their new invention: the world’s first electromagnetic shark fence, which they call the Shark Repelling System (SRS). In 2012, authorities on Réunion Island, a vacation spot near Madagascar that has experienced a dozen shark attacks in the last three years, approached the two Belgian divers about developing a 1,300-foot electric barrier to protect a popular surfing beach. 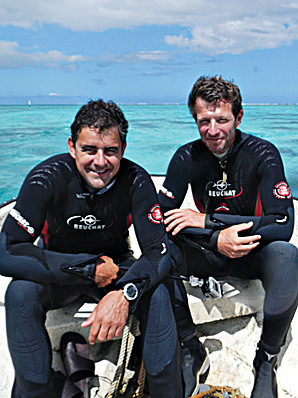 Since then, Dieudonné and Eeckhout, who met as firefighters, have set a goal of proving their technology against the five most dangerous shark species. The SRS has fended off great whites, bull sharks, lemons, and whitetips; now they need a successful test against tiger sharks. To understand how the SRS works, and why it sends sharks into convulsions but leaves humans unharmed, you first have to understand how sharks hunt. Sight is useless in the dark waters where they prowl. Instead, sharks have a kind of sixth sense called electroreception: They can detect electrical currents around them through a series of hundreds or thousands of gel-filled pores spread over their noses called ampullae of Lorenzini. All animals generate weak electrical fields from the signals shooting between nerves and neurons, but a shark’s body works like an enormous antenna. When a shark picks up an interesting signal, it moves in closer. If it seems to be something it could eat, it takes a bite. Tests on captive great white sharks have shown that they can sense electrical fields as small as 125 millionths of a volt, while newborn bonnethead sharks – whose circular heads resemble a radar dish – can detect less than 1 billionth of a volt. That’s 5 million times more sensitive than anything humans can feel, by far the most acute sense yet discovered on the planet. Dieudonné believes any potential effects of electrical current on the ecology will still be an improvement on the status quo. In 2009, while on a live-aboard scuba-diving expedition in Egypt, he watched a fellow diver bleed to death after a whitetip shark bit her leg. After a series of similar attacks, the Egyptian army closed the beaches and hunted down the sharks.